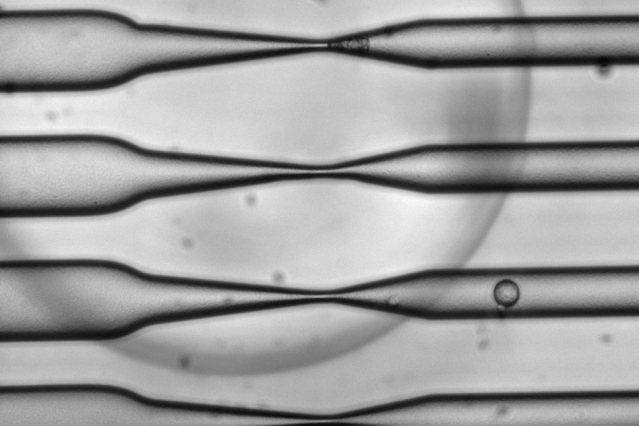 As cells pass through the CellSqueeze device at high speed, narrowing microfluidic channels apply a squeeze that opens small, temporary holes in the cells' membranes. As a result, large molecules — antigens, in the case of this study — can enter before the membrane reseals. MIT researchers have shown that they can use a microfluidic cell-squeezing device to introduce specific antigens inside the immune system’s B cells, providing a new approach to developing and implementing antigen-presenting cell vaccines. Such vaccines, created by reprogramming a patient’s own immune cells to fight invaders, hold great promise for treating cancer and other diseases. However, several inefficiencies have limited their translation to the clinic, and only one therapy has been approved by the Food and Drug Administration. While most of these vaccines are created with dendritic cells, a class of antigen-presenting cells with broad functionality in the immune system, the researchers demonstrate in a study published in Scientific Reports that B cells can be engineered to serve as an alternative. “We wanted to remove an important barrier in using B cells as an antigen-presenting cell population, helping them complement or replace dendritic cells,” says Gregory Szeto, a postdoc at MIT’s Koch Institute for Integrative Cancer Research and the paper’s lead author. Darrell Irvine, a member of the Koch Institute and a professor of biological engineering and of materials sciences and engineering, is the paper’s senior author. Dendritic cells are the most naturally versatile antigen-presenting cells. In the body, they continuously sample antigens from potential invaders, which they process and present on their cell surface. The cells then migrate to the spleen or the lymph nodes, where they prime T cells to mount an attack against cells that are cancerous or infected, targeting the specific antigens that are ingested and presented. Despite their critical role in the immune system, dendritic cells have drawbacks when used for cell-based vaccines: They have a short lifespan, they do not divide when activated, and they are relatively sparse in the bloodstream. B cells are also antigen-presenting cells, but in contrast to dendritic cells, they can proliferate when activated and are abundant in the bloodstream. However, their functionality is more limited: Whereas dendritic cells constantly sample antigens they encounter, a B cell is genetically programmed only to bind to a specific antigen that matches the receptor on its surface. As such, a B cell generally will not ingest and display an antigen if it does not match its receptor. Using a microfluidic device, MIT researchers were able to overcome this genetically programmed barrier to antigen uptake — by squeezing the B cells. Through “CellSqueeze,” the device platform originally developed at MIT, the researchers pass a suspension of B cells and target antigen through tiny, parallel channels etched on a chip. A positive-pressure system moves the suspension through these channels, which gradually narrow, applying a gentle pressure to the B cells. This “squeeze” opens small, temporary holes in their membranes, allowing the target antigen to enter by diffusion. This process effectively loads the cells with antigens to prime a response of CD8 — or “killer” — T cells, which can then kill cancer cells or other target cells. The researchers studied the squeezed B cells in culture and found that they could expand antigen-specific T cells at least as well as existing methods using antibody-coated beads. As proof of concept, the researchers then transferred squeezed B cells and antigen-specific T cells into mice, observing that the squeezed B cells could expand T cells in the spleen and in lymph nodes. The researchers also say that this is the first method that decouples antigen delivery from B-cell activation. A B cell becomes activated when ingesting its antigen or when encountering a foreign stimulus that forces it to ingest nearby antigen. This activation causes B cells to carry out very specific functions, which has limited options for B-cell-based vaccine programming. Using CellSqueeze circumvents this problem, and by being able to separately configure delivery and activation, researchers have greater control over vaccine design. Armon Sharei, now a visiting scientist at the Koch Institute, developed CellSqueeze while he was a graduate student in the laboratories of Klavs Jensen, the Warren K. Lewis Professor of Chemical Engineering and a professor of materials science and engineering, and Robert Langer, the David H. Koch Institute Professor and a member of the Koch Institute. Sharei, Jensen, and Langer are also authors of this paper. In a separate study published last month in the journal PLoS ONE, Sharei and his colleagues first demonstrated that CellSqueeze can deliver functional macromolecules into immune cells. The platform has benefits over existing delivery methods, including electroporation and genetically engineered viruses, which are limited to delivering nucleic acids. While nucleic acids can code a cell for a target antigen, these indirect methods have drawbacks: They have limited ability in coding for difficult-to-identify antigens, and using nucleic acids bears a risk for accidental genome editing. These methods are also toxic, and can cause cell damage and death. By delivering proteins directly into cells with minimal toxicity, CellSqueeze avoids these shortcomings and, in this new study, demonstrates promise as a versatile platform for creating more effective cell-based vaccines. “Our dream is to spawn out a whole class of therapies which involve taking out your own cells, telling them what to do, and putting them back into your body to fight your disease, whatever that may be,” Sharei says. After developing CellSqueeze at MIT, Sharei co-founded SQZ Biotech in 2013 to further develop and commercialize the platform. Just as the company has grown since then — now up to 13 employees — the device has also evolved. Sharei, now the company’s CEO, says that by improving the design and increasing the number of channels, the current generation has a throughput of 1 million cells per second. The researchers say they now plan to refine their B-cell-based vaccine to optimize distribution and function of the immune cells in the body. A B-cell-based approach could also reduce the amount of patient blood required to prepare a vaccine. At present, patients receiving cell-based vaccines must have blood drawn over several hours each time a new dose must be prepared. Meanwhile, SQZ Biotech aims to reduce the footprint of its device, which could potentially lower the time and cost required to engineer cell-based vaccines. As the biology and technology become further refined, the authors say that their approach could potentially be a more efficient, more effective, and less expensive method for developing cell-based therapies for patients. “Down the road, you could potentially get enough cells from just a normal syringe-based blood draw, run it through a bedside device that has the antigen you want to vaccinate against, and then you’d have the vaccine,” Szeto says. This research was funded by the Kathy and Curt Marble Cancer Research Fund through the Koch Institute Frontier Research Program, the National Cancer Institute, the National Institute of General Medicine Sciences, and the Howard Hughes Medical Institute.